With so many U.S. stamp albums on the market, it can be difficult sometimes to know what to buy. We hope our review of four specific albums will make your shopping experience easier. 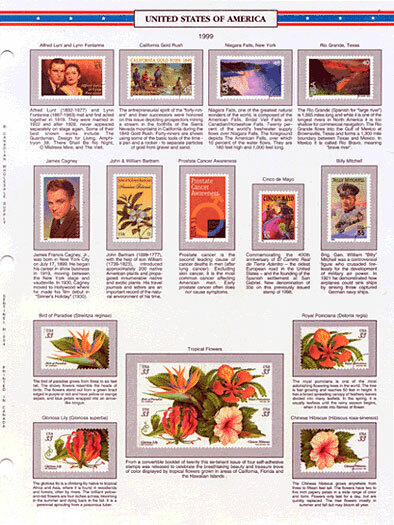 At Aprin Philately we sell what we consider to be the best United States stamp albums on the market for your money. We have four different price points to choose from, two for beginners, one for the intermediate collector, and one for advanced collectors who really want an album that delivers visual punch. Following is a description of each of these excellent albums. 1) U.S. Allegiance stamp album: This black and white album will cost you $117.90* and is ideal for the price since it is complete until 2007, and supplements for subsequent years are only $17.95. A very nice feature is the fact that its over 400 pages are printed on mediumweight paper, and all collectors know that a good quality paper is needed to keep your album looking good in the long run. It is sturdy and attractive, with a vinyl, colour cover depicting the Stars and Stripes, leaving no doubt as to its contents! 2) U.S. Harris Liberty stamp album: This is another black and white album, but it is sold in two volumes and is complete until 2005. Each volume can be purchased separately or together. Volume 1 comes in at $98.50, while Volume 2 is $63.95. Why purchase it instead of the Allegiance album? Well, the Harris Liberty come with two binders, allowing you room for expansion. Supplements for the years 2006 and up will cost you between $14.95 and $17.95, depending on the year. Its colour cover features a majestic shot of Lady Liberty. 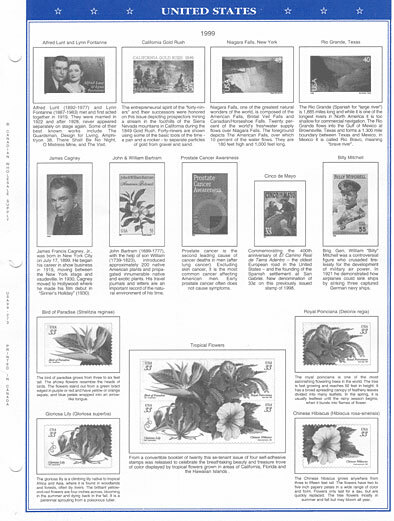 3) Seal stamp album: Our intermediate choice is extremely complete, sold in 3 volumes right up to the year 2007. It is also in black and white, but printed on heavyweight paper. It is a distinguished looking album, with a white vinyl cover and an impression of an American Seal in blue. Many stamp descriptions are contained within making it informative as well. Matching slipcases can be purchased to house it upright in complete safety for many years to come. It comes in at a cost of $232.20. 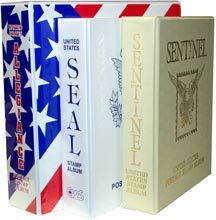 4) Sentinel stamp album: This is our deluxe album, but very reasonably priced. It is the preferred album for many since it is so elegant. The Sentinel is a 4 volume album which will run you $327.48, but wait until you see what you get! It is complete until 2007, it is also printed on heavyweight paper, but unlike the Seal album it has full colour illustrations along with many stamp descriptions. The binder is beautiful and heavy duty. As illustrated at left, it has a creamy coloured cover embossed in gold. As with the Seal album, it is also possible to purchase matching slipcovers for the Sentinel United States album. As you can see, there is something for everyone. Please visit the Arpin Philately boutique to view all these albums and their accessories. Happy shopping! Next week, check in with us for our review of the best World stamp albums.